(ATLANTA) - The Georgia Swarm (7-3) fell prey to the Buffalo Bandits' (7-2) hot offense and fell 19-9 on Harrah's Cherokee Field at Infinite Energy Arena on Saturday night. "'Dominated' would be the word," Swarm head coach Ed Comeau said when asked to sum up the night in one word. "They dominated us in every facet of the game. They outworked us, out-loose-balled us, everything. Full credit, they played with energy right from the beginning, a lot of multiple possessions, loose balls, a lot of things we talked about that we didn't want them to execute, they did. In this league, if you don't show up and play, that's the result you get." The game started with three goals from Buffalo as Georgia went scoreless in the first 15 minutes. Lyle Thompson won a loose ball battle and made a great pass to Connor Sellars for the Swarm's first goal in the second quarter. Bandits captain Steve Priolo would answer nearly four minutes later. Down 4-1 with nearly 10 minutes left in the second quarter, Zed Williams halved Buffalo's lead. The Swarm were awarded a penalty shot after a Bandits player checked Jordan MacIntosh in the back in transition. Lyle easily netted the goal, putting the Swarm back within a goal. 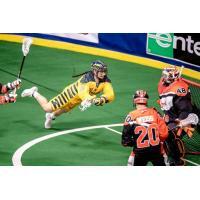 The Bandits responded with five of the last six goals in the second quarter. Their run was broken up by Williams' second goal of the night, but the two teams went to the locker room with the Bandits riding high on a 9-4 lead. The visiting team's scoring run continued into the second quarter as the Bandits rattled off five goals, chasing Mike Poulin from the pipes with their twelfth goal of the evening. Shayne Jackson finally staunched the bleeding after receiving a zig-zag pass for the Swarm's fifth goal of the night. Corey Small had the last word, ending the third quarter with the Bandits up 15-5. Both teams traded goals in the fourth quarter, scoring four apiece. The Swarm did not seem able to gain any momentum to put a significant dent into the Bandits' lead, ultimately falling 19-9. "I don't think we offered any support to either of our goalies tonight, and in this league, when you give shooters time and space either inside or outside, they're going to score goals," Comeau said. "We played ten (games) in a row, two back-to-backs," MacIntosh said. "We have one more next weekend. We need to right the ship, go into the bye (week) with a win. I think going in at 8-3, we'll be feeling good, not great, but we're going to a place that's not easy to play in with one of the best goalies in the league, really solid offense, great defense. So, it's going to be a challenge, but hopefully we can step up and show what we're really all about, unlike tonight."